The beach area has plenty of unique and beautiful scenery to explore. Many people come to Norriego Point to paddle board. No worries about boats- this is idle zone making it perfectly paddle friendly! 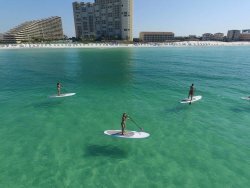 This is why so many people love to visit Destin, Florida. Its calm waters in the mornings and crystal clear view make this the perfect place to paddle out and see some wildlife. Manta rays, sting rays, dolphins, fish and manatees are among some of the unique animals to this area that can be seen near shore. You can spend a whole day paddling along the beach with stops along the coast at beachfront restaurants, bars, and state parks. 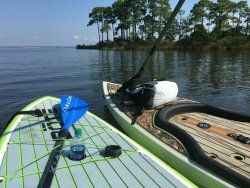 If you are an avid paddler who likes to paddle long distances the bay is the place for you. 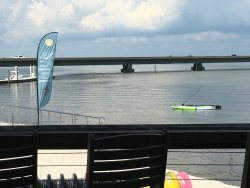 From the Midbay Bridge to the Destin Bridge, the bay is filled with calm waters and waterfront restaurants to stop into during your paddle. 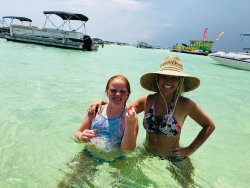 If you’re into exploring, you can venture off into Joe’s or Indian Bayou to view the beautiful waterfront houses and see some of the residential side of Destin. Also great for some casual fishing spots! To rent a paddle board call us or learn about our free demo follow us on and Like Us on .